In the open skies high over occupied Europe, P-51 Mustangs of the 20th Fighter Group, flying out of Kings Cliffe, engage Me109’s from JG77 in a furiously contested dogfight. 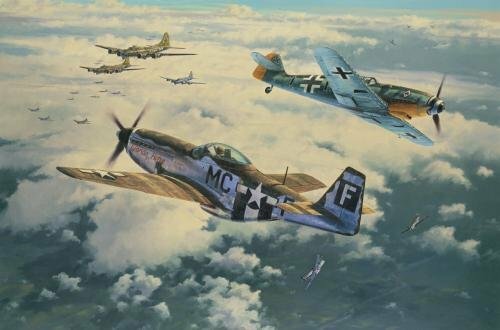 Released as a pair with A WELCOME RETURN, Anthony Saunders' new painting, CLASH OF EAGLES, features P-51 Mustangs of the 20th Fighter Group, flying out of Kings Cliffe to engage Me109’s from JG77 in a furiously contested dogfight. Below them a formation of B-17’s from the 379th Bomb Group ﬂy through the chaos, doggedly maintaining their course, as they head on to attack the huge synthetic oil reﬁnery at Meresburg, southern Germany, on 11 September 1944. So vital was this reﬁnery to the Nazi war machine that it became one of the most heavily defended targets in Germany, the air defences even surpassing those of Berlin.